With the fourth-quarter round of 13F filings behind us it is time to take a look at the stocks in which some of the best money managers in the world preferred to invest or sell heading into the first quarter. One of these stocks was The Mosaic Company (NYSE:MOS). The Mosaic Company (NYSE:MOS) was in 37 hedge funds’ portfolios at the end of December. MOS shareholders have witnessed an increase in enthusiasm from smart money lately. 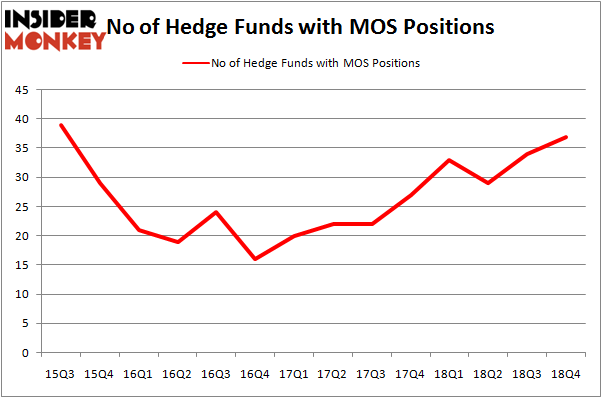 There were 34 hedge funds in our database with MOS holdings at the end of the previous quarter. Our calculations also showed that MOS isn’t among the 30 most popular stocks among hedge funds. To most stock holders, hedge funds are seen as slow, outdated investment tools of yesteryear. While there are greater than 8000 funds in operation today, Our researchers hone in on the crème de la crème of this club, around 750 funds. These investment experts shepherd the majority of the smart money’s total capital, and by tailing their matchless investments, Insider Monkey has determined a number of investment strategies that have historically defeated the S&P 500 index. Insider Monkey’s flagship hedge fund strategy defeated the S&P 500 index by nearly 5 percentage points annually since its inception in May 2014 through early November 2018. We were able to generate large returns even by identifying short candidates. Our portfolio of short stocks lost 27.5% since February 2017 (through March 12th) even though the market was up nearly 25% during the same period. We just shared a list of 6 short targets in our latest quarterly update and they are already down an average of 6% in less than a month. Let’s check out the recent hedge fund action surrounding The Mosaic Company (NYSE:MOS). What have hedge funds been doing with The Mosaic Company (NYSE:MOS)? Heading into the first quarter of 2019, a total of 37 of the hedge funds tracked by Insider Monkey held long positions in this stock, a change of 9% from one quarter earlier. Below, you can check out the change in hedge fund sentiment towards MOS over the last 14 quarters. So, let’s check out which hedge funds were among the top holders of the stock and which hedge funds were making big moves. More specifically, Adage Capital Management was the largest shareholder of The Mosaic Company (NYSE:MOS), with a stake worth $257.9 million reported as of the end of September. Trailing Adage Capital Management was Millennium Management, which amassed a stake valued at $109.4 million. Slate Path Capital, East Side Capital (RR Partners), and Chiron Investment Management were also very fond of the stock, giving the stock large weights in their portfolios. Consequently, some big names were leading the bulls’ herd. Chiron Investment Management, managed by Ryan Caldwell, assembled the most valuable position in The Mosaic Company (NYSE:MOS). Chiron Investment Management had $40.8 million invested in the company at the end of the quarter. Cliff Asness’s AQR Capital Management also initiated a $6.7 million position during the quarter. The other funds with new positions in the stock are Matthew Tewksbury’s Stevens Capital Management, Joel Greenblatt’s Gotham Asset Management, and Bruce Kovner’s Caxton Associates LP. Let’s go over hedge fund activity in other stocks – not necessarily in the same industry as The Mosaic Company (NYSE:MOS) but similarly valued. These stocks are Broadridge Financial Solutions, Inc. (NYSE:BR), Equifax Inc. (NYSE:EFX), Copart, Inc. (NASDAQ:CPRT), and Textron Inc. (NYSE:TXT). This group of stocks’ market caps match MOS’s market cap. As you can see these stocks had an average of 25 hedge funds with bullish positions and the average amount invested in these stocks was $531 million. That figure was $765 million in MOS’s case. Copart, Inc. (NASDAQ:CPRT) is the most popular stock in this table. On the other hand Broadridge Financial Solutions, Inc. (NYSE:BR) is the least popular one with only 22 bullish hedge fund positions. Compared to these stocks The Mosaic Company (NYSE:MOS) is more popular among hedge funds. Considering that hedge funds are fond of this stock in relation to its market cap peers, it may be a good idea to analyze it in detail and potentially include it in your portfolio. Our calculations showed that top 15 most popular stocks among hedge funds returned 19.7% through March 15th and outperformed the S&P 500 ETF (SPY) by 6.6 percentage points. Unfortunately MOS wasn’t in this group. Hedge funds that bet on MOS were disappointed as the stock lost 1.6% and underperformed the market. If you are interested in investing in large cap stocks, you should check out the top 15 hedge fund stocks as 13 of these outperformed the market. 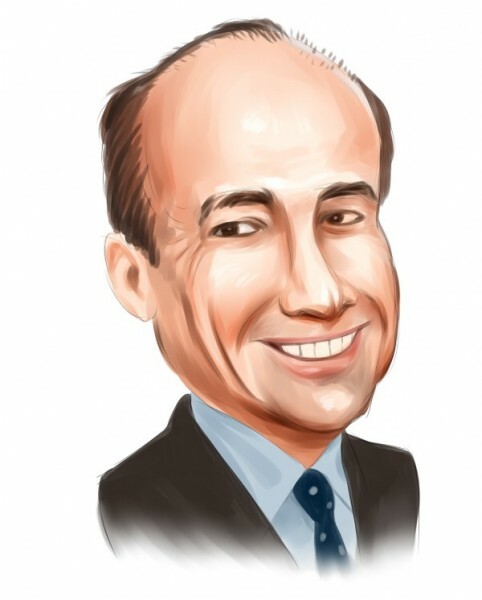 Here’s What Hedge Funds Think About Principal Financial Group Inc (PFG... Is Vulcan Materials Company (VMC) A Bargain According To Hedge Funds? Here is What Hedge Funds Think About Flocking Into ZTO Express (ZTO) Is Liberty Broadband Corp (LBRDA) A Good Stock To Buy? Activist Keith Meister Says This Year’s Market Rally and Last December’... Is CNH Industrial NV (CNHI) A Good Stock To Buy?